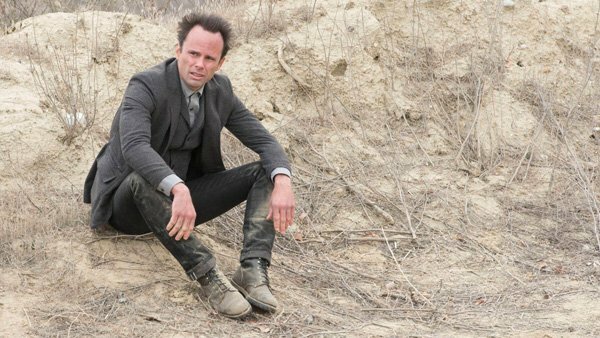 Last night I poured myself a shot of Elmer T. Lee (Boyd Crowder’s “usual,” as you might recall, and a favorite of mine as well – although I don’t think I had quite four fingers’ worth) and settled in for the weekly “Justified” Whiskey Watch. Sadly, the only whiskey I saw was the amber nectar in my own glass. Boyd and our boy Raylan Givens were too busy getting out of jams and cleaning up other people’s messes to drink much, and when they did wet their whistles in “Whistle Past the Graveyard,” they did so with beer or Jose Cuervo. Ah well, there is always next week. Until then, here’s a question for you: What whiskey would you like to see Raylan drink? We know from last week that Blanton’s is the bourbon he reaches for to impress a lady, and we’ve seen Maker’s Mark being poured. I don’t think Raylan’s the type to spring for a high-end brand (unless he wins more money as the seventh caller), but maybe Evan Williams? Knob Creek? Woodford Reserve? Sing out, Whiskey Nation.